Descending Musical Alphabet - How Well do You Know It? Learning the Musical Alphabet is a lot of fun for students, and it is an extremely handy tool. The Musical Alphabet names the keys on the keyboard and the notes on the staff. For most students, understanding this ascending pattern of A-B-C-D-E-F-G is easy. But what happens when the musical alphabet has to be said in a descending pattern? How fast can you say the descending musical alphabet: G-F-E-D-C-B-A? Delayed connection between seeing the descending intervals or patterns on the music and connecting to the corresponding key on the keyboard. Problems in reading, writing and understanding descending intervals. Slower playing (or playing at a slower tempo) when the music is descending. I would like to share an experience that I recently had with a student. 11 year old Eve is in Prep 1 Music Theory Workbook (and is completing her RCM Preparatory Level A Piano Exam). At her lesson, I realized that Eve had named a number of notes incorrectly on the Review Test on Page 26. Found the Landmark Note closest to the note on the staff. Named the interval from the Landmark Note to the note on the staff. Can you identify the reason for her boo-boos? I couldn't either. Can you see where Eve was making her mistake? Eve had named all of her notes ascending from the Landmark Note correctly as she had named all her ascending intervals correctly. However, every note that she had named using a descending interval from the Landmark Note was incorrect. Hmm... as her Teacher, it was my job to figure out why! Are you Saying the Musical Alphabet Correctly? Since I knew that Eve was counting her intervals properly (and not counting the distances - a problem that I will blog about later) I asked her to show me how to name a 5th below A. What was the first thing that she did? She said her Musical Alphabet starting on A, but she said it ascending and not descending! I had assumed that Eve understood the descending musical alphabet pattern - after all, this was her 3rd year in Piano! This was a "light bulb moment" for me. Eve needed a way to remember the descending musical alphabet quickly so that she could apply it to her music! When we read, we read from left to right. When we see the Musical Alphabet on the keyboard, we easily read going up high as A-B-C-D-E-F-G. When we read going down the keyboard, we have to read "backwards" (descending) - from right to left. This is not an easy concept for some children to understand (especially children who have struggled with tracking issues). So how did I get Eve to name her descending intervals correctly? I taught her the Musical Alphabet Song! Learn the Musical Alphabet Song! 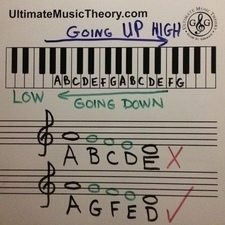 In the Ultimate Music Theory Certification Course, one of the many little "Teaching Tips" that Glory St. Germain teaches you is the Musical Alphabet Song. Eve and I sang this song several times together - and here she is singing it by herself. SUCCESS! Eve had a Light Bulb Moment Too! As soon as Eve understood that descending intervals used the Descending Musical Alphabet and ascending intervals used the Ascending Musical Alphabet, she easily named all of her notes using intervals from her Landmark Notes! Why do we teach students 3 different ways to name notes? As a Teacher, have you ever had some students that just "get" everything that you teach them, and other that just, well, don't? That is because we all learn differently. 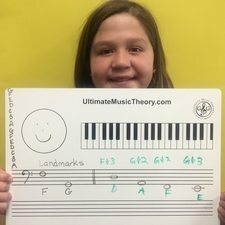 By learning how to read music 3 different ways, students of all Learning Styles - Visual, Auditory and Kinesthetic - have a Memory Jogger technique that allows them to be successful!